Self-proclaimed as “revolutionary,” the Full HD (1920 x 1080) notebook comes with a proprietary Ezel Hinge, that can move the screen everywhichway, and a full size, backlit keyboard. Rather niftily, the screen can be shunted about so it can be positioned in front of the keyboard or over it, flipped over for serving up a presentation, or the screen can cover the keyboard to turn it into a more conventional tablet. Perhaps best of all, the Ezel Hinge lets the display move behind the keyboard, so it can morph into a regular laptop. Running Windows 8 , the Acer packs an Intel Core i5 processor, with options taking the specs up to 12GB of memory, up to a 1TB hard drive or 256GB SSD. There’s Dolby Home Theatre on board plus four 8 watt speakers for that mini-movie experience. There’s a decent array of connectivity options onboard too, including HDMI out, an SD card reader, audio jacks, three USB ports, Wi-Fi, Bluetooth, with VGA output available via a possible through a converter port. “Acer believes touch will be crucial to the new computing experience,” purred Oliver Ahrens, president of Acer Europe. The Acer Aspire R7 is set to rock into the UK next month and will punish your beleaguered wallet to the tune of £899.99. NEW YORK (May 3, 2013) At a press event held today in New York, Acer unveiled the Aspire R7, a revolutionary 15.6-inch notebook that will redefine the touch and type computing experience. Featuring a Full HD 1920×1080 touch screen, the Acer R7 was made for the new computing lifestyle, which increasingly combines touching and typing. With a repositioned keyboard and a revolutionary “Ezel Hinge” that moves the display forwardand into different positions, the R7 makes the combination of touching the screen andusing the keyboard more intuitive and natural. Its ergonomic design allows users to explore anddetermine their own preferred way to interact with technology. The Acer Aspire R7 was introduced today with other new products, including the Acer Aspire P3 Ultrabook, Acer Aspire V Series touch notebooks and Acer Iconia Android tablets. The new line of News releasecer mobile products highlights the company’s focus on redefiningthe computing experience through progressive design. #AcerTouch. Available May 17th, consumers who place pre-orders with Best Buy between May 3 and May 16, 2013 will also receive a free download of STAR TREK: THE VIDEO GAME for PC as part of Acer’s marketing partnership campaign with Paramount for the upcoming film, “Star Trek Into Darkness,” opening on May 17, 2013. The Acer Aspire R7 lets consumers transform their notebook into the shape that best delivers an immersive content experience based on their usage needs. With four modes of operation, the R7 can easily be used as a traditional notebook, a table top pad, a display, or switched into “Ezel” mode, allowing the screen to float over the keyboard at various angles. This allows users to work where they want and how they want – seated or standing, at a desk or with it on their lap. The Ezel Hinge makes it easy to switchthe display around, to touch or type while creating, browsing or sharing content. Dual hinge technology allows for single-hand switching between modes and keeps the display rock-steady when touched. 1. Ezel Mode –Reach out and pull the display closer, eliminating the need to reach across the palm rest and keyboard to use the touch screen. Just pull itup and out where it can be positioned in front of the keyboard, or float over it. 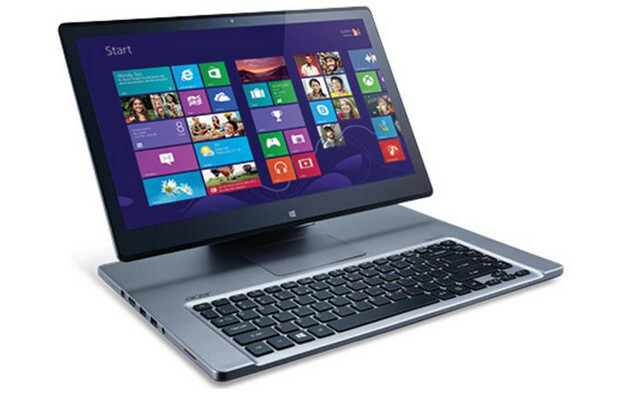 By pulling the display close, switching between touchscreen, keyboardand touchpad is seamless. 2. Notebook mode – Slide the display back behind the keyboard, and you have a powerful, full featured Windows 8 notebook computer with a 15.6-inch Full HD (1920×1080) touchscreen display, an Intel Core i5 processor, 6GB of memory, a 500GB hard drive, a 24GB SSD and a full-size backlit keyboard. It also includes a volume control button, HDMI port, SD card reader, audio jacks, three USB ports, WiFi, Bluetooth and a convenient converter port supporting VGA, RJ45 and USB. 3. Display Mode– Flip the screen over and it’s positioned perfectly for watching a movie, showing photos or giving a presentation. Sharing and collaborating is simple, enjoyable and straightforward. With Acer’s proven dual-torque design, the screenflips easily yet remains rigid when touched. 4. Pad Mode – Simply pull down the touchscreen and lay it on top of the keyboard with the face up, and the Aspire R7 morphs into a pad, without giving up the robust performance of a notebook. The ergonomic 4-degree tiltingangle makes it perfect for browsing, writing or drawing. It’s ideal for pure touch interactions like casual gaming, browsing, drawing, annotating and more. Offering a superior audio visual experience, the R7’s powerful features and high-definition display are complemented by a premium sound system with Dolby Home Theater v4 and four 8 watt speakers. Because of its transformative design, the audio channels automatically reverse when switching modes, so sound is always perfect. In addition, Acer also relocated the placement of the dual microphones from the traditional notebook layout. Instead of positioning them on the LCD bezel near the webcam, they are placed along the front of the notebook, just under the spacebar. This provides for the best voice sound quality, and enhances the aesthetics of the touchscreen by eliminating the need for holes in the bezel. In a manner befitting its revolutionary design, the Aspire R7 includes a unibody aluminum chassis, a beautiful brushed metal hinge, and an archedcover with very subtle curves and lines. The bottom features a soft touch finish for a securegrip, making it easy to grasp and carry. Even the keyboard placement was reconsidered in the new design. Repositioning it closer to the body in front of the chassis makes typing more comfortable and as efficient and as fluid as possible. The keys fall naturally under the fingers, eliminating the need to hold the arms out and over the palm rest and touch pad in order to type. The travel of the keys was also considered in the design, ensuring it is deep enough to provide a perceptible tactile response when typing, so that using the keyboard is just as enjoyable as touching the screen. Red Dot Design Awardhe Acer Aspire R7 has already been awarded with the Red Dot, one of the world’s most soughtafter quality marks for excellence in product design. The award is presented annually in the international competition by a jury of 37 design experts for the Design Zentrum Nordrhein Westfalen of Germany. Design guru Jimmy Choo joined as a member of the jury for the first time in this year’s competition, which received 4,662 entries in 19 categories. 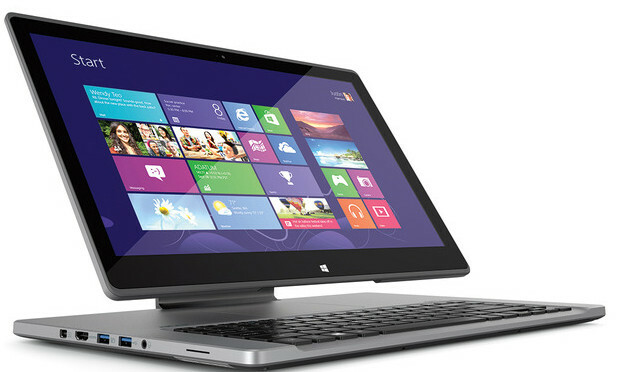 The Aspire R7 was selected in the “computers and information technology” category.